Are your valuable products being protected from the beginning of your manufacturing process to the end? If your valuable products aren't being protected from start to finish, you're losing money by decreasing the product life cycle and causing potential future repairs. Oftentimes, the expensive, delicate contents in your washing and finishing processes are being damaged by the stock baskets you're using that aren't customized for your exact specs. There is one way to ensure your product's safety: Marlin Steel's custom material handling wire baskets. 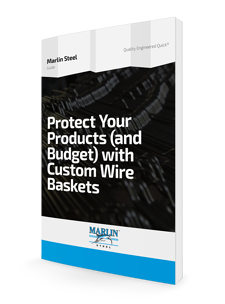 Download this guide and see the significant cost benefit you'll gain by using the right custom wire basket.